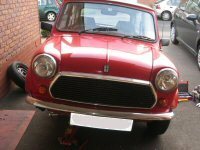 On a recent holiday that featured lots of countryside lane driving in the Mini, I started to notice that the steering was squeaking at me when I was parking. It was fine after the car cooled down, but after another drive it was squealing when I tried to park (turning the steering at a crawl). I figured that one of the steering rack gaiters had become worn and allowed the steering rack lubricant to leak out. I was later proved right as the left one was holed near the outer neck which I discovered on removal. I bought a set of Mini steering rack gaiters (or boots depending on who you ask) for a few quid. Don't buy from Motor Factors as they either try to sell you one for the same price as the kit (which contains two), or they sell universal ones that you have to cut to fit. 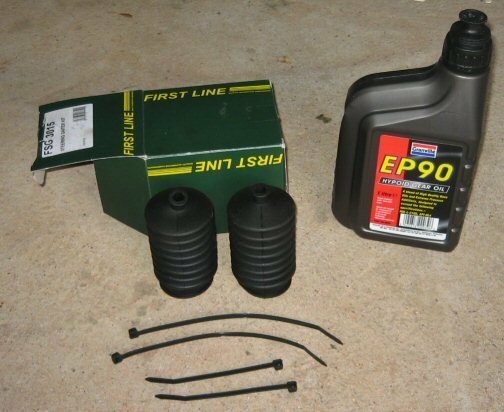 I also bought some lubricant, which meant SAE EP90 oil for my Mini. Starting with the nearside (left) side of the car, I jacked up the car, removed the road wheel, undid the nut on the steering rack outer ball joint and used a ball joint splitter to free the ball joint from the wheel hub. I was following the Haynes manual and soon realised my mistake, they work on new cars! 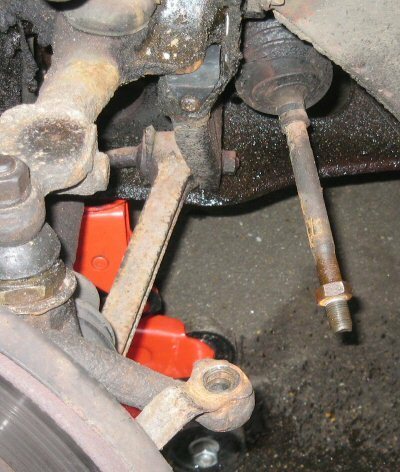 The locking nut that locks against the ball joint on the movable arm attached to the steering rack was seized tight. WD40 and heat wouldn't shift it. I managed to get the nut loose by refitting the ball joint and using a spanner and lots of elbow grease and swearing! With the ball joint disconnected from the hub and the locking nut lose, what you do next is count. 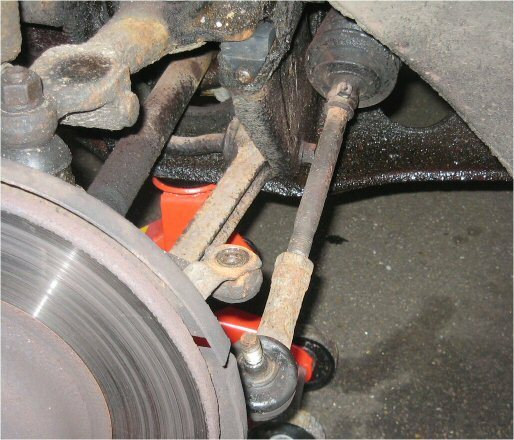 With the ball joint bolt pointing upwards, unscrew the ball joint from the bar, and with each full revolution, keep count. It took 12.2 full rotations to get the left ball joint off and 11.5 for the right. Make a note of this so that when you put everything back on, your wheels are in the same alignment as when you started. Next I removed the nut and using cutters I cut the two plastic straps holding the gaiter on. I then pulled the gaiter off. It came off inside out. I checked everything for wear and then fitted the new gaiter and used the retaining plastic ties that came in the kit. I used long-nosed pliers to pull the ties tight by gripping the tie and wrapping it around the pliers. I cut the excess off. On the pivot arm there is a groove where the outer end of the gaiter sits. Position the gaiter in this groove, wrap the tie around and pull tight. Then it's just a case of refitting the ball joint and road wheel and lowering the car. Don't forget to tighten the road wheel nuts to the correct torque. Next I moved to the offside (right) side of the car and jacked up and removed the road wheel. As before, unscrew the locking nut and then remove the ball joint nut and use a splitter to separate the ball joint from the wheel hub. Cut the gaiter ties and remove the gaiter. Now what I did here was to jack this side of the car as high as I could and use axel stands for safety as I'm going to be working under the wheel arch. I turned the steering left so that I could get at the inside of the steering rack with the gaiter removed. I poured the oil into an oil can with a bendy snout. If you try to pour the oil into the steering rack even at this angle, it just leaked out. So I wedged a clean rag around the bottom 270 degrees of the inside of the steering rack entrance so there was just a gap at the top which I inserted the oil can nozzle into. I then squirted oil into the top using a squirt-pause-squirt-pause technique. After 20 minutes the oil would just come back out so I knew the rack was pretty full. I wasn't sure how much had leaked out and the manual said it took 1 litre but it only used about an 6th of a litre so it wasn't dry. All that was left was to put the new gaiter on, secure it with ties, and replace the nut and ball joint. Easier said than done. With the ball joint in position, the nut was so tight that it just rotated the bolt in the joint. So I wire brushed the bolt lightly and screwed the bolt down until it became tight. 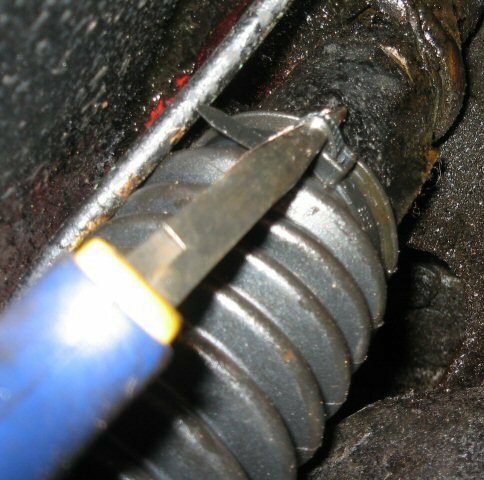 I then poured WD40 into the top of the nut and once I saw it coming out of the bottom down the grooves of the bolt I just slowly worked the nut down until it was tight. I then tightened it up to the correct torque. With both wheels back on the car I took it for a drive around the block. I found a place where I could just swing the car all over the place off the roads. I threw it into left and right turns and tested it with full lock on left and right. I gotta say the steering was very smooth with no squeaks or any noise. I must confess that it did take up most of my Sunday, but hey, it was a learning experience and cost me only time, patience, and pocket change for the parts.